In just a few short weeks, I will be stitching with today’s special guest in Salt Lake City at The Sewing Summit. I just love that she is sharing a fun tool that is tucked away in most kitchen drawers- freezer paper! Hi, I’m Lindsay Conner, an editor, writer and crafter based in Indianapolis. I’ve been crafting for as long as I can remember. As a kid, I saved my dollar bills for trips with my mom to Jo-Ann Fabrics, where I’d find new floss for friendship bracelets or mini cross-stitch kits. I started sewing stuffed toys and custom creations for friends and family, some from patterns and others from scratch. My love shifted to designing modern quilts, accessories and apparel. By day, I work as a writer, editor and crafter. In my free time, I love to travel with my husband Matt and spend quality time with our loveable cats, Murph and Chloe. Freezer paper: I’ve never used it once for cooking (although it is sold in most grocery stores), but I use it all the time for sewing. In fact, it’s one of my favorite little sewing tools, and I’m excited to visit today and share what I’ve learned! What is freezer paper? Think of wax paper that’s only coated on one side. When you iron freezer paper to fabric, it temporarily sticks, which is why it’s great for making stencils or patterns for sewing and quilting. The brown tissue paper that many patterns come printed on is not very durable. Transferring a pattern to freezer paper before cutting out is so helpful! 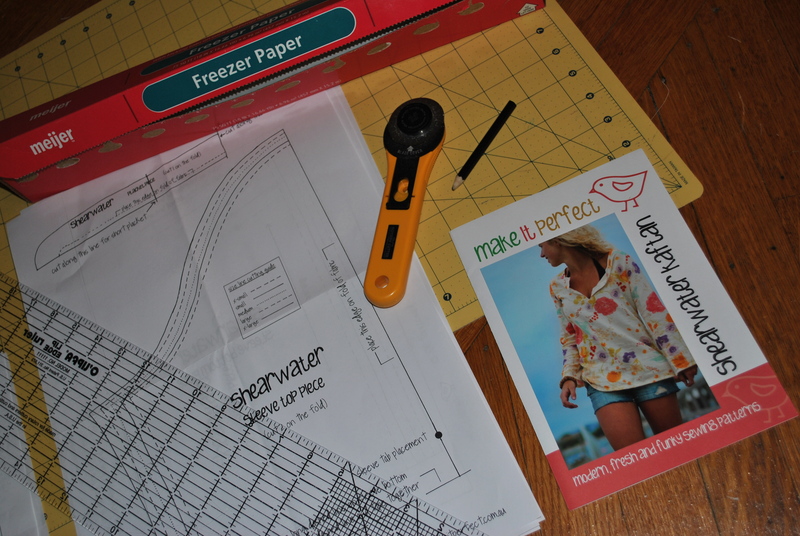 Roll out freezer paper to completely cover your printed sewing pattern. 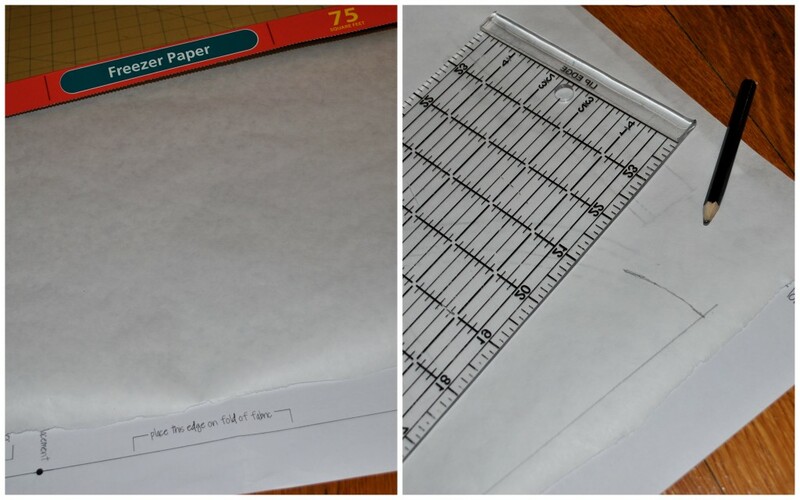 With the shiny side of the freezer paper facing down, use a pencil and ruler to trace the outline of your pattern on the freezer paper. Drawing on the matte (non-shiny) side, you will be able to faintly see the pattern lines through the freezer paper. For tips on running a handmade business and even more fun tutorials from Lindsay, be sure to stop her blog Craft Buds. You will not be disappointed! On tap for tomorrow is no stranger to sewing tutorials- Caroline is stopping by from Sew Can She. I’ve used regular butcher paper for patterns. I got a HUGE roll of it from Sam’s Club. I use white glue thinly spread on the wrong side of the pattern, then just glue it to the butcher paper. I wish I’d have known about the freezer paper, but now that I have this humongus roll of butcher paper, I’m kind of stuck with it. I’ve also gone to the local surplus store, and gotten a roll of heavy plastic. When I have a pattern that I use a lot, I’ll glue it to the plastic and then cut out the plastic. Works great! Great tip Roxann! Thanks for sharing. I love using craft paper. You can purchase it by the roll. I do the same thing, but slightly differently. Instead of tracing the pattern, I iron the pattern to the freezer paper wax side when I’ve taken the lighter pattern out of it’s envelope. First I iron it to get out the wrinkles from the pattern, and then I iron the freezer paper onto the backside of the pattern paper. I then cut out the pattern with my rotary cutter. I may waste freezer paper this way, but it saves me a HUGE amount of time in tracing it out and freezer paper is cheap in comparison to the amount of time saved. I then use plastic storage bags to store the patterns with the envelope and it’s instructions into it and they go into an old metal file cabinet. Because I use weights and rotary cutting to cut my sewing patterns out, it is nicer because the weight of the wax paper ironed onto the sewing pattern just gives that extra strength to not have tears, and I get nice crisp curves and corner turns as well when rotary cutting. Great idea Marian. Thanks so much for sharing! I trace my patterns on to freezer paper because I like to iron the pattern piece right on to the fabric I am going to be cutting. If it is double on the fold, I use pins and it makes it much easier to cut the fabric out. I sometimes even use my rotary cutter and ruler. Plus this way my patterns always stay new and uncut. Doing this, I can keep using the pattern for different sizes in the future if I want or need to. I then pin the new freezer paper patterns to the envelope of the pattern for future use. I love freezer paper! I use left over Christmas wrapping paper. It’s kind of time consuming to trace with carbon paper and a tracing wheel. Since the patterns come in different sizes on one sheet, I copy all sizes. Then store in brown paper envelopes with the pattern name and number. I also take a picture of all my patterns and load them to my laptop. This way I can search for what to make easier. Organized by size, boy, girl, adult, home, craft. etc.